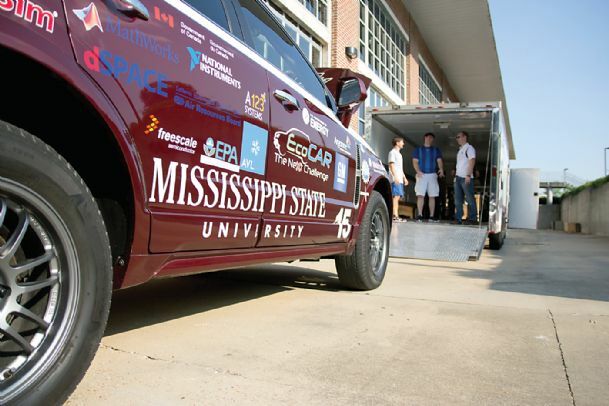 The Mississippi State University EcoCAR 3 team is currently preparing for fall workshop across all six of our sub-teams which range from technical to communications. We will be traveling to Boston, Massachusetts for fall workshop on Sept. 29 and returning to Starkville on Oct. 4. We are looking forward to seeing the other EcoCAR 3 competitors and gaining knowledge from industry leaders that will help us prepare for final competition. One exciting area of the competition focuses on innovation. Our team has been hard at work in this area over the last several months. We look forward to watching our innovation topic progress from a public announcement in the next few months all the way to possible implementation in our vehicle in the next few years. Our team operates with over 100 students, all working to lead us to success in the competition. Through building the car of TOMORROW, we are bridging the gap between academia and industry TODAY. We believe that this is going to be an incredible year for EcoCAR 3 at Mississippi State and we are looking forward to every minute of it! We look forward to sharing our progress with you throughout the remainder of competition! ©2015. Clean Cities-Georgia. All Rights Reserved.